One of the most important parts of your makeup is your foundation. It gives you the ability to smooth fine lines, to hide imperfections, and to put your best face forward. 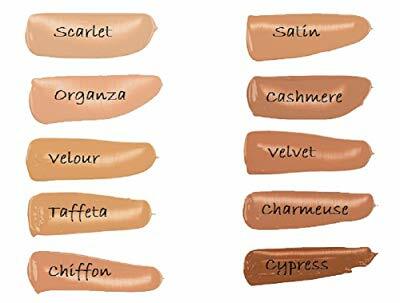 Regardless of your skin type, there are hundreds of different foundations that you can choose, such as oily, dry, and combination skin formulas – this is why we’ve compiled this Younique Foundation Reviews, so you can make an informed decision which to choose. Younique has developed a 2 particular foundations that are adaptable to all skin types and give you the most amount of coverage possible without making your face feel heavy and packed with product. The Younique Moodstruck Touch Mineral Liquid Foundation (Velour) and Mineral Cream (Velour) are two specific formulas that you should take into consideration. Our review is designed to help you pick the right foundation for any occasion, whether you have a romantic date or if you’re spending the weekend with the girls. Velour is by far the most popular shade of the Younique liquid foundations. If you have yellow or golden undertones, this formula will blend seamlessly with your skin. Recommended with women who have complexions between light and medium, you’ll easily be able to achieve a sun kissed and healthy glow once you apply the foundation. One of the main reasons as to why people search for foundation is to help cover their blemishes. Instead of relying on formulas that force you to also use concealer to hide pimples, spider veins, and hyper pigmentation, this product does all of the work for you. All you will have to do is buy the foundation, apply it, and watch your skin transform before your eyes. If you’re looking for a medium to high coverage foundation, this is the most affordable formula that you’ll find. Regardless of how many years of experience you have with wearing makeup, Younique’s liquid foundation is perfect for beginners and veterans. You won’t have to worry about spending a lot of time blending the shade out onto your face and neck to have it match your particular skin tone as the colors are true to their pictures. You’ll also find that if you use under eye concealer or cream contour, it’ll be incredibly simple to work with as the foundation sets a strong base that makes it easy to blend with other products. When designing their makeup items, Younique takes pride in the fact that all of their formulas include natural ingredients that are healthier for your skin than artificial fillers from other makeup brands. This helps to make the liquid foundation feel light and airy when applied, instead of feeling like you’ve caked on way too much makeup. You’ll achieve the perfect level of coverage and feel comfortable wearing the foundation throughout the day. If you’re not the type of person that enjoys using liquid foundations, you will be interested in this product. Again, as the most popular shade offered from Younique, Velour works best with women who have light to medium toned skin. The pressed cream is perfect for covering an array of imperfections ranging from pimples to hyper pigmentation. The difference is that it is easier to work with, especially if you find it difficult to properly apply liquid foundations. One of the largest benefits that you’ll experience when you start using the pressed cream is a flawless finish without having to put a lot of effort into the application or blending. You can choose whether you want to use a beauty sponge, a foundation brush, or even your fingers if you’re looking for a light to medium coverage. Once applied, your skin will have the perfect base for your blush and bronzer, creating an airbrushed finish that you would only be able to achieve with high-end cosmetics. Instead of having to carry a bottle of liquid foundation with you everywhere you go, you can easily put the cream in your purse or clutch for easy on-the-go touchups. Whether you’re going to a club with your friends or if you have a planned date, it is the most convenient way to make sure that your makeup stays flawless throughout the entire night. Plus, the integrated mirror makes it simple to check and apply the product if you’re not near a bathroom. Some makeup brands create foundations that feel oily and caked on when you apply even the smallest amount of the product, but with Younqiue’s pressed cream you’re going to get a creamy and soft feeling. You won’t have to worry about your makeup essentially sliding off of your face because of an excessive amount of oil. Instead, the product works with your skin to create a flawless finish that looks natural but perfect at the same time. It will not only appear to be soft and creamy, but it will also feel soft. It can always be best to find makeup products that can double as something else. When you buy the pressed cream you won’t be forced to only use it as a foundation as you can also use it as a concealer for imperfections or under your eyes. Since the formula doesn’t settle into fine lines, you can choose a shade lighter than your skin and apply it after you’ve put on your foundation for added coverage. If you prefer to not use concealer, it still works as a phenomenal foundation for every occasion. Got your perfect foundation? Check out our best 3d fiber lash mascara guide! Younique Foundation Reviews Summary - With the combination of natural ingredients and scientifically proven manufacturing standards, Younique’s foundations are perfect for women with every skin type and of every age. You deserve to be able to feel comfortable in your own skin, regardless of whether you’re suffering from acne or permanent scarring. With the simple and quick application of either formula, you’ll achieve a flawless finish every time.